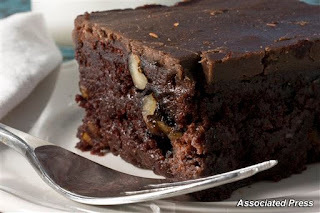 These fat free brownies are easy to make (just add fat free vanilla yogurt) and delicious. They come in mint, raspberry, cappuccino or plain. And a serving is only 120 calories and no fat! If you’re worried about portion control, mix 2 tablespoons of mix with 1 tablespoon of fat free vanilla yogurt in a mug and microwave it for a minute or so. I love them with light vanilla ice cream or Cool Whip free! This recipe is so easy. There are only 3 ingredients: A box of fudge brownie mix, peanut butter and a can of pumpkin puree. Ok. Bear with me here. I know it sounds weird, but pumpkin is high in fiber and low in fat. And you can hardly taste it. Just mix the mix and pumpkin together, top with peanut butter, put it in an 8x8 pan and bake it at 350 degrees for 35 minutes. Let it cool, and then pop the pan in the fridge. Warning: Don’t taste the fudge before it has been chilled. For some reason, if you taste it right out of the oven the pumpkin flavor is stronger than if it’s chilled. Steph Chows’ Mocha Mousse is made with tofu and greek yogurt, and while I haven’t tried it yet, I definitely plan to. There's no cooking involved. Just blend and serve! Weight Watchers has a recipe for Chocolate Turtle Cookies using fat free cream cheese, egg whites and fat free milk. If you’re not worried about consuming too many treats this coming weekend, check out our We (Heart) Chocolates review. The demands of this job are almost too much. I had to spend a whole day eating chocolates. For you guys. Tough. Real tough. Are you planning any healthy treats for Valentine’s Day? Share with us! This entry was posted by kate, on Monday, February 8, 2010. You can leave your response .